* Disclaimer: Some meals and accommodations were provided. It’s really difficult to have your BFF in another state, but there is one perk to having her in a different city—you get to visit often! Luckily, Southwest has an easy-peasy direct flight from ATX to NOLA, so I like to jet off to visit mine at least once a year. When I got assigned a travel piece from Austin Monthly on the Big Easy, I took the opportunity to head back to discover any new noteworthy places to include in my article. Here’s where I ate during my most recent trip that I absolutely adored. Straight from Louis Armstrong Airport, my bestie took me to Tartine, a cute French sandwich shop where she and I split a couple of open faced sandwiches. I love eating with her because we like similar things and can share a lot easier than with my pescatarian boyfriend! The pork rillette tartine was rich but tasty and a great meal to start off my trip. 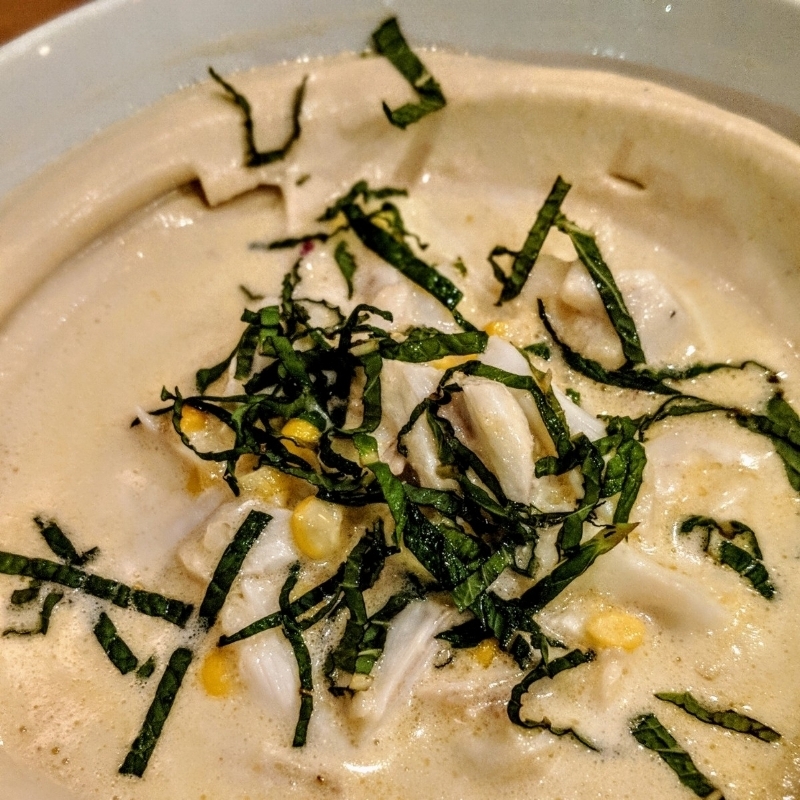 I finally got to check out Mopho, a hip Vietnamese eatery slinging pho (duh) and other fusion dishes. The sticky chicken wings were worth every messy bite! Another spot I was super excited to try was Bon Appetit’s 2017 Best New Restaurant Turkey & The Wolf. 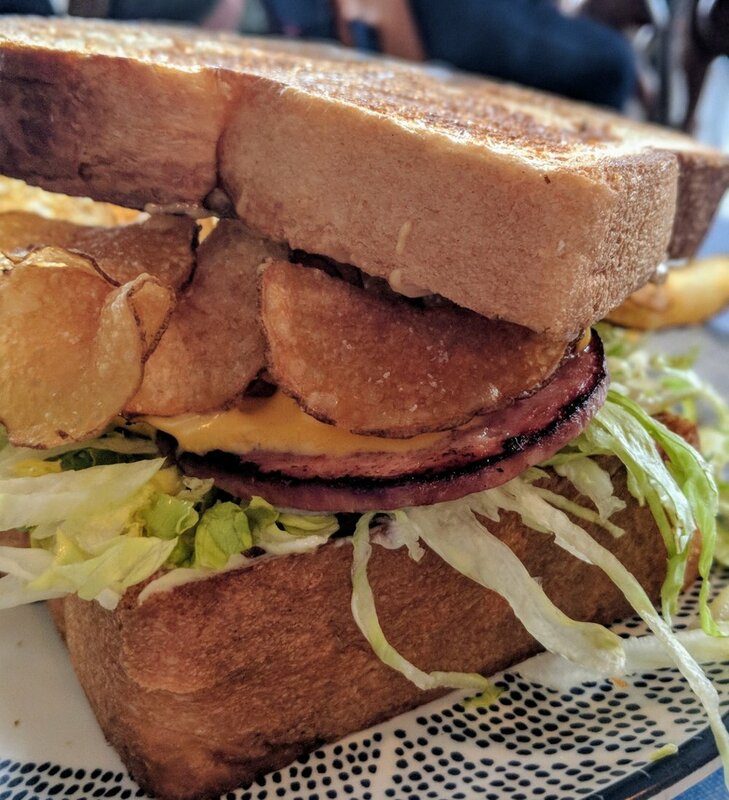 The fried bologna sammie came STACKED with crispy potato chips on top of huge slices of buttery bread. It was extremely greasy on my hands but so good in my belly. I topped off my second day with an absolutely gorgeous dinner at Alon Shaya’s new restaurant Saba. I may have weaseled into some reservations through the PR team, and I’m SO happy I did. It was a stunning meal, from start to finish. We began with a sampler of Middle Eastern dishes (salatim) that included lutenitsa (roasted eggplant, tomato, red pepper), Bulgarian feta with leeks and coriander, and red grapes with pickled red onion—not to mention the absolute most pillowy pita I’ve ever eaten. Then, perhaps my favorite dish of the night, the blue crab hummus, which was creamy and silky and has totally ruined hummus for me forever. We finished with octopus, harissa chicken, and grilled romaine. (We were definitely too stuffed for dessert!) The eatery is also super adorable with white and blue walls, plucking you out of the steamy streets of NOLA and onto a balmy Mediterranean isle instead. Worth a visit, for sure! The next day, my bestie and I checked into the Ace Hotel for an overnight staycation. We hit the adorable rooftop pool, which has gorgeous views, and sipped glasses of rosé while relaxing. After our dip in the pool, we headed downstairs to Seaworthy to enjoy half-off oysters during happy hour (SO affordable!) and then changed for dinner. The gorgeous Josephine Estelle serves up Southern classics as well as Italian fare. We enjoyed some summer apps, including the summer squash with burrata and the smoked crudo with peaches, before ordering a pasta course (cacio e pepe, swoon! ), and some meaty mains. Our blueberry crostada dessert was a delicious way to end the decadent meal. We MAY have lived it up pretty hard after our dinner—heading to the French Quarter to heavily drink at some of our favorite dive bars—so we were feeling pretty rough the next day (thank you, late checkout! ), so we hoofed it to the new Pythian Market food hall so we wouldn’t have to agree on some hangover food. I indulged in a meaty and olive-rich pizza at Meribo. Paired with a glass bottle of Barq’s (a must while in New Orleans! ), I was right as rain. We kept it pretty low-key for the rest of my trip, enjoying some traditional NOLA snowballs and a couple of beers at the city’s breweries—Wayward Owl Brewing Company, which is housed in an old movie theater, is a delight—we finished my trip at Marjie’s Grill, which fuses together Asian and Southern cuisines. The crab and peach salad was super fresh and seasonal, while the spicy som tam salad was too much for my friend’s toddler (to be fair, it was pretty darn spicy, but so good!). The highlight of our meal was the fried cornmeal crusted chicken served with Thai spices. We had to all fight over the pieces and probably should have ordered another round! Their desserts were also great, with more peaches on the menu in the form of a tart and a buttermilk chess pie served with nectarines. Whew, I ate a lot, huh?! Needless to say, I left New Orleans with a very full belly! Haven’t been to the Crescent City and looking for more traditional New Orleans recommendations? Pick up my article in Austin Monthly when it comes out in October!